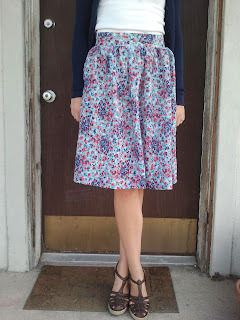 This is the skirt I was telling you about! It looks easy but it took me all summer. Mostly because I was too busy having fun to finish it. Thanks for the hot pink pin cushion from Aunt Reva. I adore it. I read religiously! Cute skirt! Miss you! Glad you could use the hot pink pin cushion. Aunt Reva would be happy. @Dani Christensen I got the shoes ages ago; I can't even remember where.